Well, here is another one of my experiments that I must say again, it was a total success. The name is probably inaccurate, since a strudel is basically a layered pastry, but I thought it was getting very close, so I decided to use it. However, eat this thing with ice cream and there will definitely be no comparison… mine is better [heh]. Start by warming up half the milk in a microwave, on high for about 20 seconds, you don’t want it boiling. To the milk add a teaspoon of honey and a couple tablespoons of flour. Mix, add the yeast, mix again well, then let it sit for about half hour. After half hour, the dough starter should have doubled up in size. Add this dough starter to the mixer bowl, then add the egg and the sugar. Mix it until it’s well incorporated. Add the flour to the bowl, the butter, vanilla extract, the remaining milk, salt and mix on medium speed for a couple minutes. The dough should be soft and pliable. Form in a ball and let it rise in a warm spot. While the dough is rising, you can get the peaches ready. 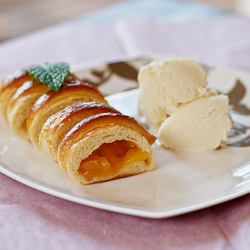 You’ll need about three large peaches for the eight “strudels” [:P]. Wash the peaches, peel them and remove the pits. Cut them up in slices, they don’t have to be too thin. In a small sauce pan add the peaches and ¼ cup of sugar. Turn the heat to medium and cook them for about 5 minutes. Let the peaches cool, as they need to be cold before we add them to the pastry. Also the dough should take about an hour to double in size. When you are ready cut it in eight equal pieces and roll each one of them up in a ball. The thing with the dough is that you really need to let it rise a lot so… let them rest for another half hour and they will double in size… again. When you are ready, take one of the balls, and roll it out into a rectangle about 6 inches (15cm) wide and 6 inches long. Place a heaping tablespoon of the peach filling into the middle of the rectangle, and fold one of the sides over the filling. Use a fork to seam the dough. Now take a pair of scissors and cut the other third of the dough into thin strips as you see in the picture below. Now this is fun… Take each long strip and fold it over the roll and tuck it in underneath. Continue this with the remaining dough and peaches. Place them on a cookie sheet lined with a silpat or parchment paper and let them rest for about 10 minutes. Before baking, brush each strudel with egg wash and bake in the oven at 375° F / 190° C for about 30 minutes or until golden brown. They look cute, don’t they. Warm up half the milk in a microwave for 20 seconds. To the milk add the honey and a couple tablespoons of flour. Mix it all well, then add the yeast. Whisk it all well together and let it sit for half hour. After half hour add the dough starter to the mixer bowl, the egg and half the sugar. Mix it until it’s well incorporated. Add the flour to the bowl, the butter, vanilla extract, the remaining milk, salt and mix well on medium speed for a couple minutes. The dough should be soft and pliable. Form in a ball and let it rise in a warm spot. Wash the peaches, peel them and remove the pits. Cut them up in slices, they don’t have to be too thin. In a small sauce pan add the peaches and ¼ cup of sugar. Turn the heat to medium and cook them for about 5 minutes. Let the peaches cool completely. After the dough has doubled in size, cut it in 8 equal pieces and roll each one of them up in a ball. Let them also rest for 30 minutes. When they are ready, take one of the balls and roll it out into a rectangle about 6 inches (15cm) wide and 6 inches long. Place a heaping tablespoon of the peach filling into the middle of the rectangle, and fold one of the sides over the filling. Use a fork to seam the dough. Now take a pair of scissors and cut the other third of the dough into thin strips. Take each long strip and fold it over the roll and tuck it in underneath. Continue this with the remaining dough and peaches. Place them on a cookie sheet lined with a silpat or parchment paper and let them rest for about 10 minutes. Brush each strudel with egg wash and bake for about 30 minutes or until golden brown. They look super delicious! And you are right about the name that is exactly how you would call them in Germany. I can’t wait to try them!